The domain within your query sequence starts at position 260 and ends at position 280; the E-value for the FES domain shown below is 2.16e-5. 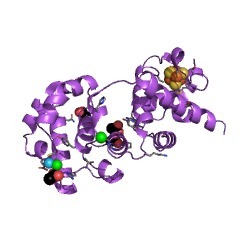 Endonuclease III (EC 4.2.99.18) is a DNA repair enzyme which removes a number of damaged pyrimidines from DNA via its glycosylase activity and also cleaves the phosphodiester backbone at apurinic / apyrimidinic sites via a beta-elimination mechanism [(PUBMED:7773744), (PUBMED:9032058)]. 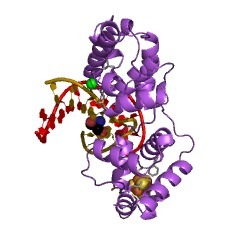 The structurally related DNA glycosylase MutY recognises and excises the mutational intermediate 8-oxoguanine-adenine mispair [(PUBMED:1328155)]. The 3-D structures of Escherichia coli endonuclease III [(PUBMED:1411536)] and catalytic domain of MutY [(PUBMED:9846876)] have been determined. 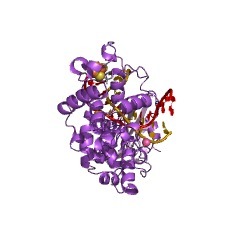 The structures contain two all-alpha domains: a sequence-continuous, six-helix domain (residues 22-132) and a Greek-key, four-helix domain formed by one N-terminal and three C-terminal helices (residues 1-21 and 133-211) together with the Fe4S4 cluster. The cluster is bound entirely within the C-terminal loop by four cysteine residues with a ligation pattern Cys-(Xaa)6-Cys-(Xaa)2-Cys-(Xaa)5-Cys which is distinct from all other known Fe4S4 proteins. 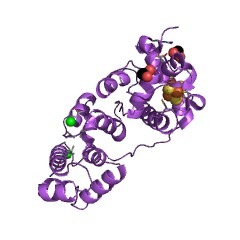 This structural motif is referred to as a Fe4S4 cluster loop (FCL) [(PUBMED:7664751)]. 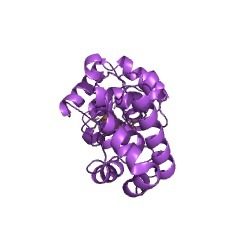 Two DNA-binding motifs have been proposed, one at either end of the interdomain groove: the helix-hairpin-helix (HhH) and FCL motifs. 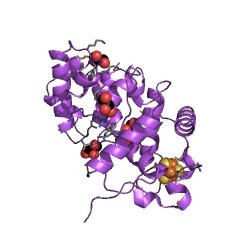 The primary role of the iron-sulphur cluster appears to involve positioning conserved basic residues for interaction with the DNA phosphate backbone by forming the loop of the FCL motif [(PUBMED:7664751), (PUBMED:10900127)]. 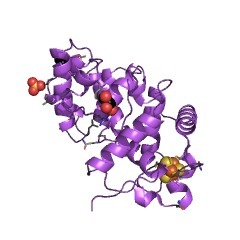 The iron-sulphur cluster loop (FCL) is also found in DNA-(apurinic or apyrimidinic site) lyase, a subfamily of endonuclease III. The enzyme has both apurinic and apyrimidinic endonuclease activity and a DNA N-glycosylase activity. It cuts damaged DNA at cytosines, thymines and guanines, and acts on the damaged strand 5' of the damaged site. 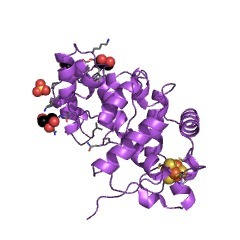 The enzyme binds a 4Fe-4S cluster which is not important for the catalytic activity, but is probably involved in the alignment of the enzyme along the DNA strand. There are 36082 FES domains in 35394 proteins in SMART's nrdb database. Taxonomic distribution of proteins containing FES domain. This tree includes only several representative species. The complete taxonomic breakdown of all proteins with FES domain is also avaliable. Click on the protein counts, or double click on taxonomic names to display all proteins containing FES domain in the selected taxonomic class. Positively charged residues within the iron-sulfur cluster loop of E. coli MutY participate in damage recognition and removal. 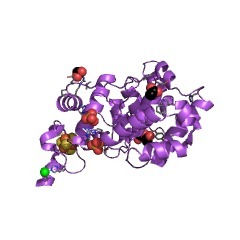 Escherichia coli MutY is an adenine glycosylase involved in base excision repair that recognizes OG:A (where OG = 7, 8-dihydro-8-oxo-2'-deoxyguanosine) and G:A mismatches in DNA. 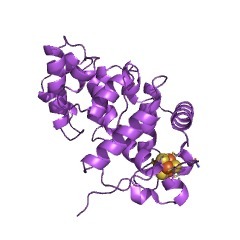 MutY contains a solvent-exposed polypeptide loop between two of the cysteine ligands to the [4Fe-4S](2+) cluster, referred to as the iron-sulfur cluster loop (FCL) motif. 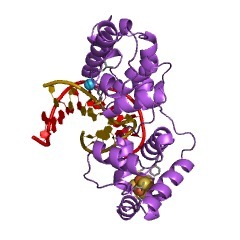 The FCL is located adjacent to the proposed active site pocket and has been suggested to be part of the DNA binding surface of MutY (Y. Guan et al., 1998, Nat. Struct. Biol. 5, 1058-1064). 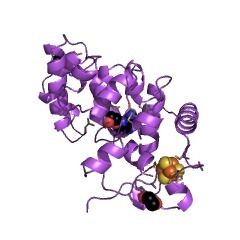 In order to investigate the role of specific residues within the FCL motif, we have determined the effects of replacing arginine 194, lysine 196, and lysine 198 with alanine on the enzymatic properties of MutY. The properties of the R194A, K196A, and K198A enzymes were also compared to the properties of mutated enzymes in which lysine residues near the active site pocket were replaced with alanine or glycine. Substrate recognition was evaluated using a duplex containing a 2'-deoxyadenosine analog in a base pair opposite G or OG. 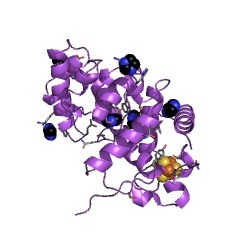 These results indicate that removal of positively charged amino acids within the FCL and the active site compromise the ability of the enzyme to bind to the substrate analog. 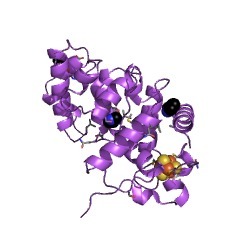 However, only the K198A enzyme exhibited a significant reduction (15-fold) of the rate of adenine removal from a G:A base pair-containing duplex. 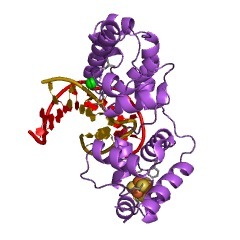 This is the first direct evidence that Lys 198 within the FCL motif of MutY has a role in specific damage recognition and removal. Furthermore, these results suggest that the FCL motif is intimately involved in the base removal process. DNA repair proteins act to correct mutagenic and toxic DNA damage, which can lead to cancer, aging and death. These proteins and their mechanisms of action have been found to be widely conserved between species, often from bacteria to man. Structural and biochemical studies on several bacterial enzymes involved in direct reversal and base excision repair have provided insights into the molecular basis of the recognition of damaged DNA and have also highlighted the novel roles that transition metals play in DNA repair. 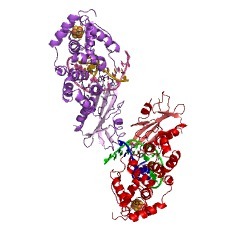 The crystal structure of the DNA repair enzyme endonuclease III, which recognizes and cleaves DNA at damaged bases, has been solved to 2.0 angstrom resolution with an R factor of 0.185. This iron-sulfur [4Fe-4S] enzyme is elongated and bilobal with a deep cleft separating two similarly sized domains: a novel, sequence-continuous, six-helix domain (residues 22 to 132) and a Greek-key, four-helix domain formed by the amino-terminal and three carboxyl-terminal helices (residues 1 to 21 and 133 to 211) together with the [4Fe-4S] cluster. 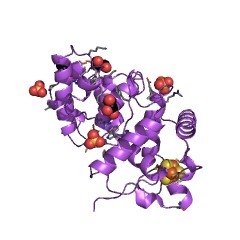 The cluster is bound entirely within the carboxyl-terminal loop with a ligation pattern (Cys-X6-Cys-X2-Cys-X5-Cys) distinct from all other known [4Fe-4S] proteins. Sequence conservation and the positive electrostatic potential of conserved regions identify a surface suitable for binding duplex B-DNA across the long axis of the enzyme, matching a 46 angstrom length of protected DNA. 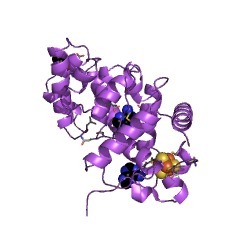 The primary role of the [4Fe-4S] cluster appears to involve positioning conserved basic residues for interaction with the DNA phosphate backbone. 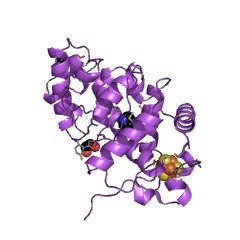 The crystallographically identified inhibitor binding region, which recognizes the damaged base thymine glycol, is a seven-residue beta-hairpin (residues 113 to 119). 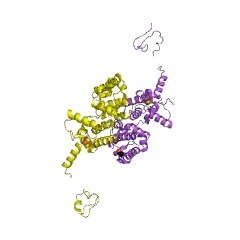 Location and side chain orientation at the base of the inhibitor binding site implicate Glu112 in the N-glycosylase mechanism and Lys120 in the beta-elimination mechanism. 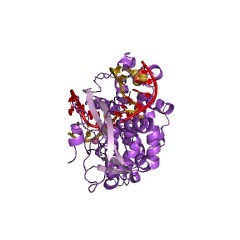 Overall, the structure reveals an unusual fold and a new biological function for [4Fe-4S] clusters and provides a structural basis for studying recognition of damaged DNA and the N-glycosylase and apurinic/apyrimidinic-lyase mechanisms.